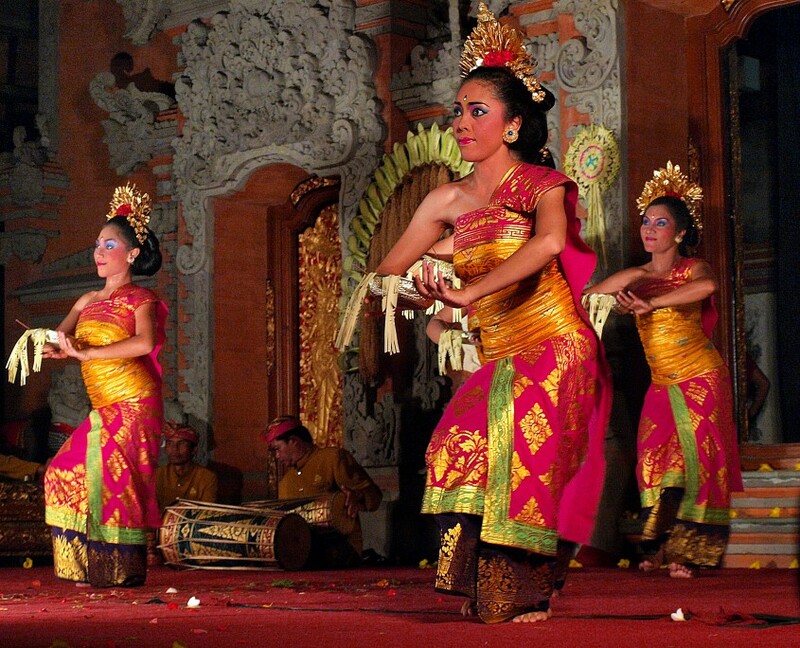 In Bali there is a large number of dances. Listing them all would result in a tiresome list. Most people don’t get to see outsiders anyway. The following, on the other hand, are listed regularly. 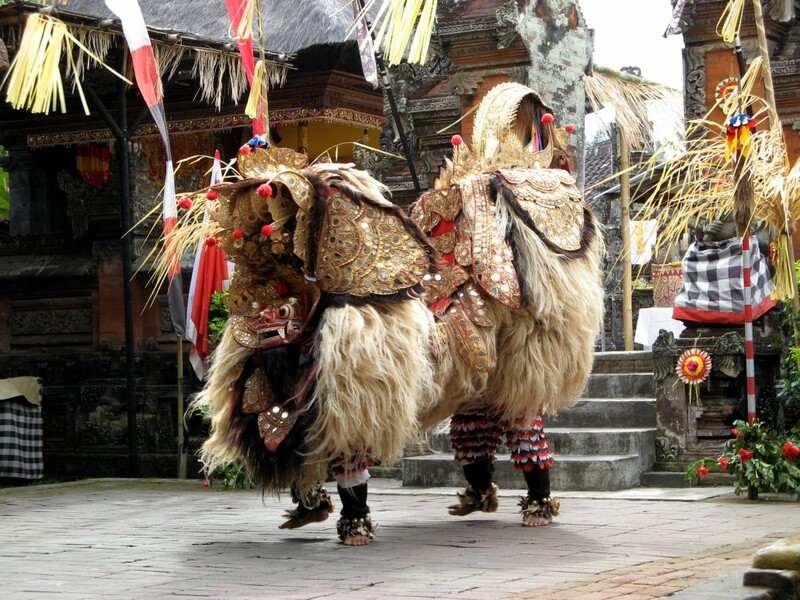 The Legong is graceful, noble and captivating and is particularly popular with the Balinese. And so it is easy to imagine that this is the dance of heavenly nymphs. Traditionally, the Legong is performed by three young girls, and so it is understandable that it is the dream of all adolescent Balinese to be able to dance for a recognized group. A dream that is also over for the chosen ones with their first menstruation. The smooth, flowing movements are accompanied by a Gamelan orchestra and tell the story of the beautiful Princess Rangkesari, who wanders into the dark forests of King Lasern. When he finds the princess, he robs her and tries – in vain – to seduce the young girl. Horrified by the fate of the princess, her brother Daha fled to war against the kidnapper. The highlight of the dance, however, is not the battle, but a premonition of Lasem. By a bad omen he is predicted to die soon after being attacked by a golden bird. The enchantingly danced farewell scene, in which Rangkesari and the enemy king separate before the battle, has already fascinated many a spectator. Known, mysterious and full of magic, this ritual dance is often performed for tourists. Here, evil and good take on each other in a vividly personalized form. There is never a winner, because according to Balinese beliefs, good and evil must coexist in order to secure the balance of the world. And so they fight against each other again and again: The Barong, who embodies the good powers in his impressive form like a lion, the face a mask with tusks and a long mane, and the Rangda, who embodies all evil with her claw-like fingernails, terrible fangs and the long scarlet tongue. The story is told by Prince Sadewa, who is to be sacrificed to the death goddess Durga. The god Shiva – embodied by a priest – has compassion for the king’s son and gives him superhuman powers and immortality. When Durga realizes that she cannot defeat her opponent, she asks for the death that promises her redemption. Sadewa refuses and furiously with rage, the goddess of death transforms first into a boar, then into a griffin, but is always defeated by the prince. Only when she turns into the horrible black witch Rangda, Sadewa can no longer stand up to her and becomes a barong. Both are now equally strong and the good people called upon to help cannot decide the battle. From Rangda in a trance they try to kill themselves with the Keris, only the sight of the barong keeps them away. The dancers who play these enchanted helpers are often in a real trance state and must be brought back into the here and now by a priest at the end of the performance, using holy water and offering offerings. 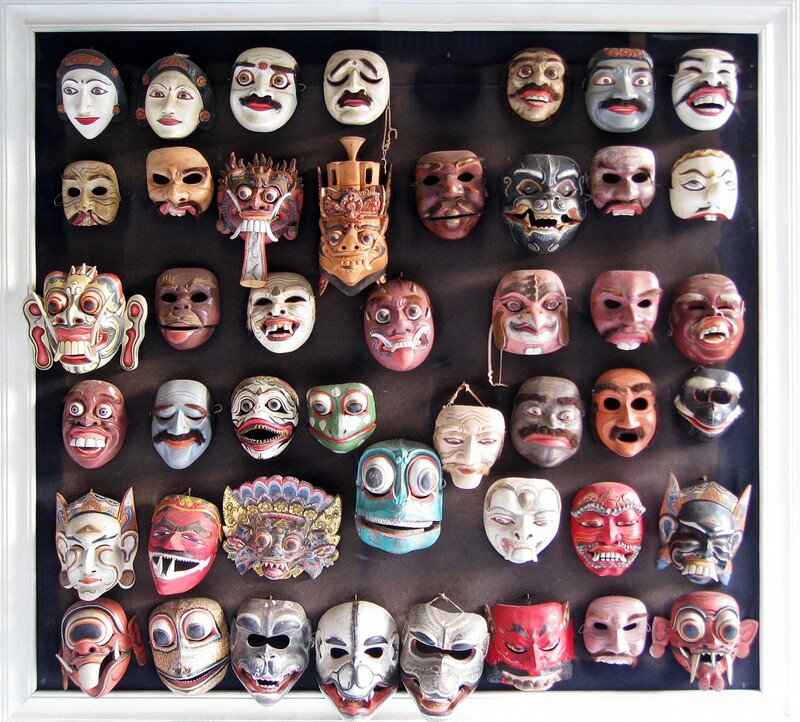 The masks of the main protagonists – especially those of Rangda, who are said to have deadly magical powers – are immediately wrapped up after the dance and kept in the designated place in the temple. The Baris is actually a ritual war dance, which should make the gods merciful before battles and secure their support. 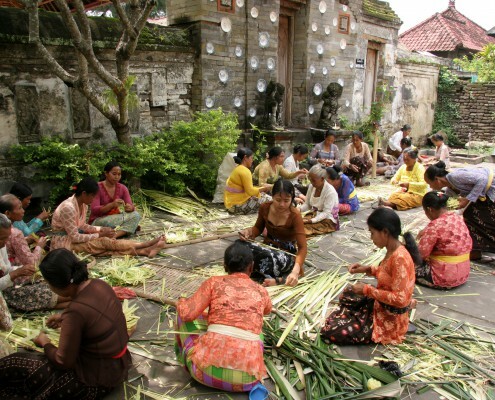 It is often performed at the Odalan (Festival of the Consecration of the Temple) or other ritual festivals. The Gamelan Orchestra, glamorous costumes, elaborately painted faces, dancers who have every tendon in their body under control, and especially weapons are an integral part of all variations of the Baris. In an impressive show fight the men compete against each other to prove their intrepidity to themselves and the audience with dance movements and strong facial expressions. As a variation, the Baris can also be performed by only one dancer. Take a man and 30 masks and let him report without words of deeds such as the misdemeanours of the ancient kings and princes. The cornerstone for the dance drama Topeng has already been laid. A wonderful mixture of pantomimic narration and dance, during which the actor transforms into a multitude of people only through his skill and the masks available. Two topeng dances are distinguished: the religious topeng pajegan, which is only performed during important ceremonies, and the secular, entertaining topeng panca. The most important difference is the use or omission of a mask: The Sida Karya, a sacred and magical mask, guarantees the effectiveness and success of the performed ceremony with the Topeng Pajegan. This is not used by Topeng Panca, which is usually played by five people. Instead, this dance is often commented by one or two narrators or clowns, while the Gamelan Orchestra amplifies the mood and situations with sound effects. The Gambuh is one of the oldest dance forms and was first mentioned in 1007. Walter Spies already noted that this dance was the “basis of all dances”. While the Gambuh was formerly performed at the princely courts as an extremely expensive entertainment, today it is only held during ceremonies and temple festivals to entertain the gods. You also need a really persistent sitting table to experience the original form of the dance, because the whole cycle can last one week and is performed exclusively in the Old Java Kawi dialect. It’s good to know that the story, accompanied by a gamelan gambuh orchestra dominated by flutes and string instruments, is about Prince Panji and his fiancée. When Balinese people set off for evening entertainment, it’s the offer and preferences that decide. They themselves do not distinguish between dance or theatre, because the transitions are? gourmet, as already described. You either go to the Legong or the Joged or you go to the drama, the Wayang Kulit, dive into the world of shadows and experience “cinema” in a completely different way. Apparently simpler, purer, and yet as magical as no Hollywood blockbuster could ever do. The name wayang kulit indicates what the viewer will experience: a play with the shadows (wayang means ghost) of leather-covered dolls (kulit means skin) – and this is always a special event. Far after sunset, the performance begins on the specially constructed stage. Even the children in the first rows in front of the screen are silent and stare eagerly at the shadows of the kings, demons and heroes who scurry over the lit sheet. Accompanied by the voices given to them by the puppeteer (dalang), only illuminated by the damar, a special oil lamp made of coconut wood, which is used exclusively for shadow play. In the background, a man pulls the strings or literally makes the dolls dance. No ordinary dolls. They are all unique, made of leather in filigree precision work by gifted craftsmen – often the Dalang himself – according to certain rules. Colourful painted, noble and charged with magical powers. For the performance and certain rituals, the puppeteer can of course only use the most flawless puppets without a single processing error to fulfill his task. And he has many of those. The Dalang is a storyteller and teacher, a philosopher and entertainer. On the canvas, it unites microcosm and macrocosm: the lamp represents the sun, the banana tree on which it sits is the earth. And on the screen, which embodies the sky, the stories take place. In them all beings appear, which are to be found between heaven and earth: humans, spirits, animals, gods. They are controlled by the Dalang, who becomes a kind of God during the performance. During an often four-hour performance, the puppeteer combines current themes with old stories and the knowledge from ancient Lontar writings – always anxious to master the balancing act between teaching, teaching and entertainment. That is why a good Dalang is also an excellent connoisseur of the background of his company, which is why puppeteers were already recognised advisors in the times of the royal dynasties. That’s why he had to complete many years of training, which is why he is a respected man, speaks the old Javanese language Kawi, knows more than 100 stories by heart, can combine and master all three levels of Balinese. He lends these to the respective figures depending on rank and form of existence: gods express themselves exclusively in high Balinese, the elite and princes in middle Balinese and simple characters speak in low Balinese. He can give each character a unique voice. The Dalang is also a mediator between the people and the gods and thus maintains the balance of the world. Because in addition to entertainment, he also conducts ceremonies. 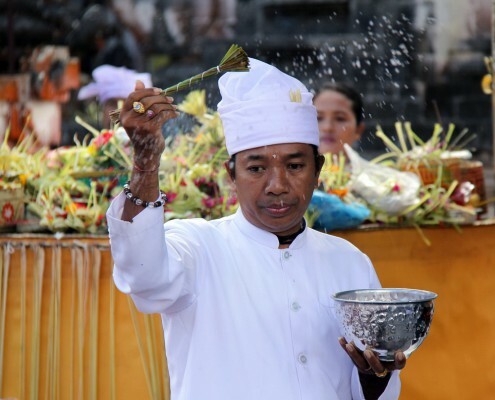 Thus, during the game wayang Iembah water transforms into thirta, becomes holy water used for certain ceremonies. Since this piece only takes place during the day, the figures – freed from the umbrella, which otherwise only reveals their silhouette – are displayed in all their beauty. Old texts with religious-magical content are also brought to the screen, mostly during certain rituals: on temple birthdays, weddings, tooth-filtration ceremonies or when a child was born on an unlucky day. Through his play, the Dalang snatches this child from the death goddess Kali. A good Dalang can do all this. Of course, even more people are involved in the success of the shadow play: On the one hand, the Dalang has helpers who give him the puppets he needs. And what would a Wayang Kulit performance be without the Gamelan Orchestra? The puppeteer conducts this with small wooden sticks, which he holds with his toes, and accompanies the scenes with rhythmic music, which always matches the figures and their actions. The orchestra uses a repertoire of different styles to show the audience what it is all about. Only now can we speak of an experience that takes the spectators into a horrible, unfamiliar world of graceful shadows and light.